Most Americans say the government should play a significant role in reducing obesity among children. But there is strong opposition to government involvement in this effort among conservative Republicans and Tea Party supporters. The latest national survey by the Pew Research Center for the People & the Press, conducted Feb. 22-March 1 among 1,504 adults, finds that 57% say the government should play a significant role in reducing obesity among children, while 39% say it should not. The new survey finds wide partisan and ideological differences regarding the government’s role in combating obesity. 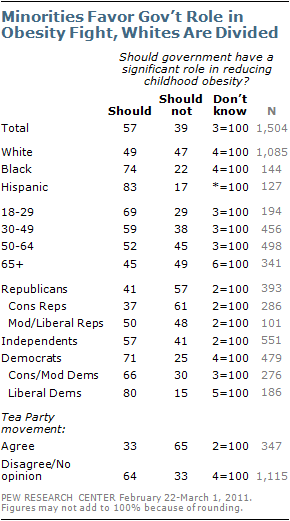 Overall, about seven-in-ten Democrats (71%) say government should have a significant role, compared with 57% of independents and 41% of Republicans. Four-in-five liberal Democrats (80%) say the government should have a major role tackling this issue, a view shared by just 37% of conservative Republicans. Just a third (33%) of those who agree with the Tea Party think government should have a significant role in fighting childhood obesity, while about twice as many (65%) say it should not. Hispanics and African Americans are far more likely than whites to say the government should play a role in combating childhood obesity. Large majorities in both groups (83% of Hispanics, 74% of African Americans) express this view, while just 49% of whites agree. Younger Americans are far more likely to see a significant role for government in cutting childhood obesity than are older Americans: Almost seven-in-ten (69%) of those younger than thirty say government should play a major role, while just 45% of those 65 and older agree.